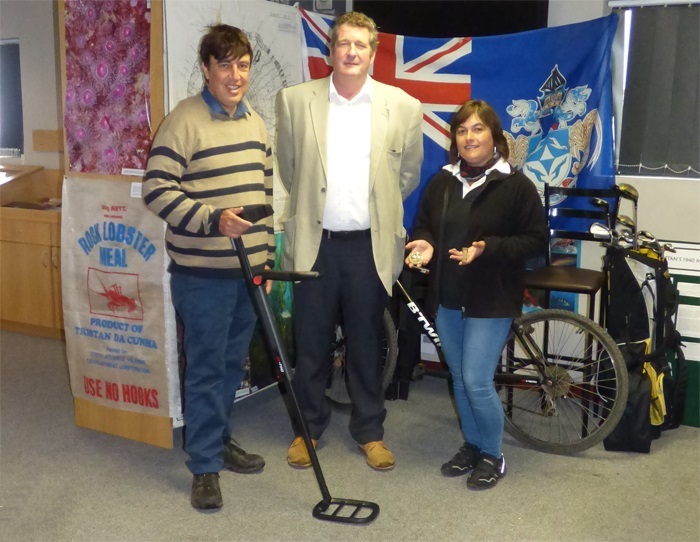 Visitor Gan Erez has donated a metal detector to the Tristan da Cunha Museum. During the recent 2018 visit of the SA Agulhas II, we were very pleased to welcome to Tristan a visitor from Israel called Gan Erez. Gan is a well known metal detectorist, and he won a competition that enabled him to travel to the island. Gan very kindly donated a metal detector to the Museum. This is something Dawn Repetto has always wanted to purchase for the Museum, so she was very excited to receive it. It will be used to help investigate some of sites used in Tristan's early days, such as the Mission Garden. Gan Erez (left) presents a metal detector to Administrator Sean Burns and Head of Tourism Dawn Repetto for the Museum.